Made in Hong Kong, 1930s. 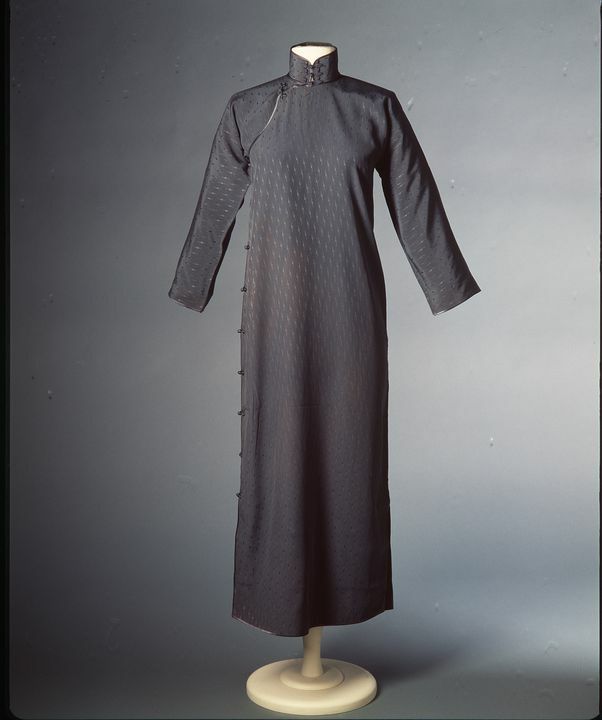 Full length women's cheungsam with rounded hemline, long sleeves and a high wingless collar. The left hand side of the cheungsam crosses in front of the body to close on the right hand side, and is secured with leaf silk knots designed to sit within silk loops. The cheungsam is made of a blue/grey silk damask with a white thread and pattern shot through. The toggle knots can be left unfastened to create a daring high side vent. There is a matching blue/grey trim around the collar, sleeves and hem. Lined with blue silk. The atmosphere of change in the late Qing period, the demise of Manchu rule and the formation of the Republic brought changes for women througout urban China, including their clothing. The internal changes and the increasing influence of Western fashion both contributed to the development of the cheung sam during the 1920s. The cheung sam can be traced back to the Manchu robes of the Qing dynasty. Towards the end of the 19th century womens robes became slimmer and more revealing. High fashion cheung sam of the 1920s fell straight from the shoulders in a slight A-line to the hem which was usually just below the knee. During the 1930s hemlines for evening wear dropped to the ankle and cheung sam became more fitted and revealing with the side vents reaching the thigh. Towards the end of the 1930s the hem rose to mid calf and sleeves lengthened to the wrist. During the 1940s cheung sam had long, short or cap sleeves and were worn in a variety of lengths, the side opening was often mirrored on the left as a design feature. This particular cheung sam was designed for a more mature women hence it is a looser fit than other high fashion cheung sams of the same period. Fung Huken Manter, Hong Kong. This cheong sam was part of collection of costume acquired by the vendor from Joseph Fung, son of Fung Huken Manter, it is unclear who in the family may have used it. Fung Huken Manter was born in Guangdong in 1895. He moved to Hong Kong when he was 12 years old to join his grandfather who ran an import/export business. In 1915 he went to America to study for a few years. In 1920 Fung opened a business with four partners making gold chains at Des Voeux Road in Hong Kong. During the 1930s he moved to Saigon to keep a closer eye on his business there and live a life of luxury. After the war Fung tried his hand at distilling but lost most of the fortune he has amassed before the war. Fung died in 1986 leaving a large family from several wives and a number of concubines. Part of a collection of costume acquired by the vendor from Joseph Fung, son of Fung Huken Manter (1895-1986), a Hong Kong merchant.